Camelot designs, builds and renovates homes to meet the unique needs of each customer. Combining project management, an experienced crew dedicated to excellence, and a business philosophy based on honesty and integrity. The result is a successful project that comes in on-time, on-budget and a happy family. With each project we think of our customers as a part of our family and with each new remodel project we accept the responsibility to make your experience the best it can be. Your project is a reflection of our company and our work. We put the same pride and craftsmanship into any home we work on as if it was our own. 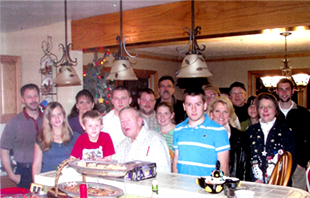 Our family of happy clients is the best source of marketing we have in Northern Michigan. Please take the time to look at some of recent projects on this web site and review the comments from our new family members. Camelot Construction is a fully licensed & insured residential contractor that has been serving Northern Michigan for over 15 years. We specialize in residential renovations and new construction. Camelot's remodeling services including additions, decks, kitchens, bathrooms, finished basements, roofing, siding and more. We are a full service contractor, with solid working relationships with highly qualified and licensed electricians, plumbers and heating contractors. You'll find many before and after photos of our work throughout this web site as well as references from some of our previous clients. We offer free estimates and if you have any questions, please call us. Camelot brings an outstanding commitment to quality no matter the size of your project. We do this by taking a small personalized approach with each project, unlike larger construction companies in Northern Michigan, a combination for making any project a success. Camelot gets the job done right the first time because your satisfaction is our #1 priority. Feel free to contact any of the references listed here on our site to hear how happy they are with the work that we have done for them. For superior quality work at reasonable prices, look no further than Camelot Construction. Call Today! Our Family of Happy Clients! "We hired Camelot to build our detached garage then decided to have them take over from the original builder to finish the exterior and interior work on our new home. The transition was easier than we expected because they had many good ideas and suggestions for us to consider. We felt that Dennis and Marty always had our desires in mind and our interests at hear. The wood trim work they did was beautiful! The subcontractors Camelot used were excellent. Since finishing the main floor of our home, we've had them back twice to build a beautiful screened porch and finish our lower level. Both were completed to our satisfaction. We've come out of this experience with a home we love and two new friends." 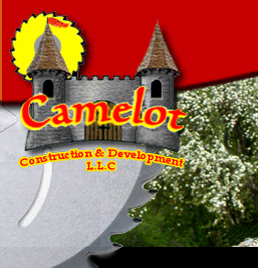 "We are pleased to be able to recommend Camelot Construction & development for your next home improvement project. Dennis Grant and his team have done two major and a few small projects for us over the past few years. The first project was the addition of a two story deck and patio doors to our dinning room. The second and even larger project was the addition of a two story 21'x21' Master Bedroom and a lower level Bonus Room. Both of these projects have not only added value to our home, but also have added more quality to our life. Dennis approaches his projects with enthusiasm, experience and dedication. Over the past two years he has been in direct communication with us about our home improvement plans. He not only listened to us, but he also was able to make some valuable recommendations along the way. For example, he was able to work out a perfect step transition from our garage to the new deck. His team showed up when they said they were going to and Dennis was there everyday to be sure the project was moving right along. Dennis is conscientious about the quality of work that is performed by his company and when there is an "issue" he is there to make it right. For example, when we had an unexpected down pour on the 4th of July and our roof was trapped of he came over to check to be sure things were okay. In addition, Camelot Construction was able to design and build custom cherry and oak moldings and trims around our fireplace, doors and windows. These moldings were then expertly installed by Camelot's Team. Dennis and his team are hard working, honest and dependable. Too often projects are started and left for weeks on end, but this is not he case with Camelot Construction, they consistently met their time line. Often Camelot's team were left in our home with only the company of our very small dog, Sassie, and we were never once concerned. They respectful of our home, made friends with our dog and tried to keep the mess to a minimum. Like most home improvement projects we went over budget, however it was not directly related to the craftsmanship of Camelot, but once you get stared on projects it is hard to not want to do just a little more than originally planned. For example, Dennis assisted us in adding a clay paver walk way for our drive around the backside of the home so we would have a clean approach to our new deck. "A home is a persons castle" and in our case this is true. We have always loved our home, but now there is more to love and the additions have made our view and life more enjoyable. We truly appreciated the dedication and the quality of craftsmanship that Dennis Grand and Camelot Construction have to offer. If you wish to make an appointment to see our "Camelot" projects, please feel free to contact us. We can be reached at the Business Helper in Suttons Bay or at the phone number noted below. "